We have their own Onsite Installers, Save on having 3rd party installations. call 07 5547 5122 for an appointment. We have developed long time support from various suppliers like: EPSON, Hitachi, Sharp, Panasonic, Pioneer, Optoma, Gilkon, LP Morgan by Herma, Crestron, Amber Technology and Audioworks. 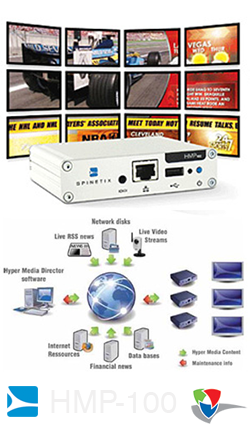 The Hyper Media Player from SpinetiX is the all in one digital signage solution that eliminates the need for PC’s. No moving parts and fully networkable, the HMP100 is the ideal solution for all digital signage applications. Call NOW on (07) 5547 5122 or click here for more information. Australian Presentation Systems tempt you to surf our extensive online audio visual presentation catalogue. Whether your needs are for a multimedia projector or a total systems installation of a projector with screen and surround sound system.